Children at a Moray school have been visited by a special guest to help launch a national campaign encouraging more pupils to walk to school. 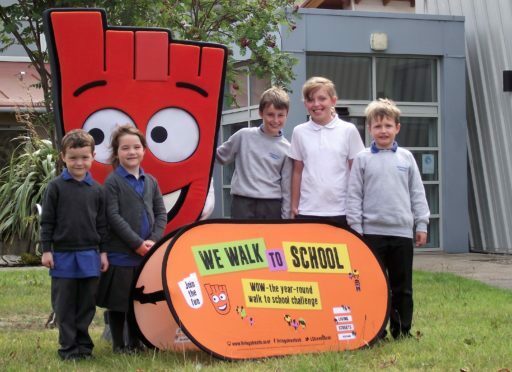 Living Streets Scotland is running WOW, a year-round walk to school challenge, and kicked off the scheme at Bishopmill Primary School. Children who walk to school at least once a week will be rewarded with a badge each month, with a total of 10 to collect across the academic year. Each journey will be logged on the WOW Travel Tracker, which will allow school staff access to see who has earned a badge and to monitor walking rates across the year. Strider, the mascot for Living Streets, turned up at a special assembly last week to launch the initiative. Head teacher Madeline McCutcheon said: “Bishopmill Primary is proud to be launching the WOW programme for this academic year. Our pupils have been using the interactive Travel Tracker for years now and they love having the opportunity to log their journeys each morning as they arrive at school in a fun, engaging and easy way. Living Streets promotes walking to school as an easy way for children to get fit, refreshed and ready to learn. They believe it is also a great way for children to be taught vital road safety skills and build lifelong healthy habits. There’s often reduced congestion on roads near schools involved in the scheme along with improved air quality and safety for both pupils and nearby residents. Stuart Hay, director of Living Streets Scotland, said: “WOW is simple to run and pupils love to take part. Just a few minutes of a teacher’s day is all it takes to make a big difference.